By-election success: The recent Gaven by-election was a success for SOSA as well as the National Party candidate took place and proved to be a bonus for the campaign. All of the 10 polling booths were staffed by enthusiastic SOSA volunteers who handed out leaflets advising voters of the stand taken by all candidates for the by- election and urged them to "Vote to save our spit." Nearly all candidates supported the SOSA campaign, except the Labor candidate who toed the party line and stated he wanted the environmental impact study (EIS) to 'stack up'. 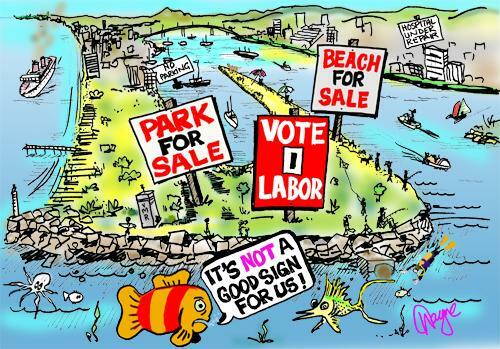 However SOSA doesn't want the shipping terminal built on public land at the Spit and in the Broadwater regardless of the EIS' stacking up or otherwise. The polling booth exercise raised the public awareness of the campaign issues and gathered hundreds more signatures for the petition. The EIS has started: On Friday 21st April the consultancy firm appointed by the Beattie Government, Gutteridge Haskins and Davey to undertake the EIS on the Gold Coast Marine Development Project will conduct its first public consultation exercise. This will be held next to the Department of Transport on the Spit and since they do not appear to have any data to show us it is more an information gathering exercise for GHD as well as a requirement of the EIS. The Terms of Reference for the EIS are available on the Department of State Development website, but requests that the EIS be conducted over a full year's seasonal variations of climate and breeding seasons have been ignored. This EIS on a 'notional' (sic) shipping terminal will be completed by end of July after which it will be publicly displayed and the public can make submissions about its adequacy. The Petition Grows: The petition signatures are rapidly approaching our target of 15,000 and volunteers at the Spit report that people are lining up to sign it. In addition to this there are over 800 letters downloaded from the website saveourspit.com which will be delivered to a local Labor politician's office shortly. We hear that local Labor politicians are getting nervous about the success of the campaign and the potential impact on their seats in the next full election. Well they might. Join a Winning Team: Meetings for the SOSA campaign are held every second Tuesday and many more activities are being planned. If you would like to be part of this successful environmental campaign please contact me on 0412 724 222.